Endogenous opioid peptides have an essential role in the intrinsic modulation and control of inflammatory pain, which could be therapeutically useful. In this study, we established a muscular electroporation method for the gene transfer of pro-opiomelanocortin (POMC) in vivo and investigated its effect on inflammatory pain in a rat model of rheumatoid arthritis. The gene encoding human POMC was inserted into a modified pCMV plasmid, and 0–200 μg of the plasmid-POMC DNA construct was transferred into the tibialis anterior muscle of rats treated with complete Freund's adjuvant (CFA) with or without POMC gene transfer by the electroporation method. The safety and efficiency of the gene transfer was assessed with the following parameters: thermal hyperalgesia, serum adrenocorticotropic hormone (ACTH) and endorphin levels, paw swelling and muscle endorphin levels at 1, 2 and 3 weeks after electroporation. Serum ACTH and endorphin levels of the group into which the gene encoding POMC had been transferred were increased to about 13–14-fold those of the normal control. These levels peaked 1 week after electroporation and significantly decreased 2 weeks after electroporation. Rats that had received the gene encoding POMC had less thermal hypersensitivity and paw swelling than the non-gene-transferred group at days 3, 5 and 7 after injection with CFA. Our promising results showed that transfer of the gene encoding POMC by electroporation is a new and effective method for its expression in vivo, and the analgesic effects of POMC cDNA with electroporation in a rat model of rheumatoid arthritis are reversed by naloxone. We are now in an era of molecular medicine in which increasing focus is being placed on gene therapy as a potential approach for the treatment of several disorders in various types of patients. Several previous studies have reported that multinucleate and post-mitotic myofibres in skeletal muscle are capable of both long-term transgene expression and systemic delivery of proteins to the blood circulation. Gene delivery to skeletal muscle has therefore been investigated as a method of creating a tissue reservoir for the secretion of non-muscle proteins such as growth hormone. Different functional genes, including those that encode factor IX [1–3], erythropoietin , kallikrein  and interleukin-12 , have been delivered to skeletal muscle for potentially therapeutic purposes. It has been shown that endogenous ligands, and especially the opioid peptides, are expressed by resident immune cells in inflamed peripheral tissue. Environmental stimuli and endogenous substances such as corticotropin-releasing hormone and cytokines can stimulate the release of these opioid peptides, resulting in local analgesia and suppression of the immune system . A therapeutic 'pain-killer gene', encoding pro-opiomelanocortin (POMC), produces the opioid peptides β-endorphins, other shorter endorphins, adrenocorticotropic hormone (ACTH) and α-melanocyte stimulating hormone. Injection of POMC cDNA with a gene gun has produced analgesic effects in phase 2 of the formalin test . The possibility exists that this exogenous POMC-mediated analgesia could be used for the control of chronic inflammatory pain such as rheumatoid arthritis or osteoarthritis. Various studies have focused on the application of gene delivery using viral vectors such as adenovirus, retrovirus and herpes simplex virus for muscle-based gene therapy. However, the use of these viruses as vectors has been hindered by viral cytotoxicity, host immune rejection after repeat dosing, and limited transient transgene expression [9–12]. Adenoviral vectors are able to infect both mitotic myoblasts and post-mitotic immature myofibres and can be prepared at high titres (109 to 1011plaque-forming units/ml) [13, 14]. However, stability and long-term transgene expression using first-generation adenoviral vectors have been hampered by the immune rejection in muscle. In addition, novel mutant vectors were developed subsequently and such mutants have reduced the problems associated with viral cytotoxicity and immune rejection [2, 15, 16]. Electroporation is a physical method of introducing macromolecules into cells by applying a brief electrical pulse that causes transient changes in membrane permeability [17–19]. Moreover, electroporation as applied to muscle has been found to be relatively safe, and has the additional advantage of not being restricted by post-mitotic muscle cells. On the basis of the principle of electroporation, we developed a new strategy to achieve the transfer of the gene encoding the intramuscular 'pain-killer' POMC in vivo and determined the optimal transfection efficiency. The safety of the procedure, in terms of potential damage to muscle tissue, and the effectiveness of the gene transfer (that is, analgesic potency) were assessed by using parameters including thermal hyperalgesia, serum ACTH, endorphin, paw swelling and muscle endorphin levels after intramuscular electroporation into rats in which arthritis was induced by the injection of complete Freund's adjuvant (CFA). Total RNA from human pituitary gland was extracted by TriZol Reagent (Clontech Co). The cDNA was synthesized by reverse transcription with oligo(dT) as primer (BcaBEST RNA PCR kit; TaKaRa Biomedicals Co). The gene encoding POMC was then amplified by polymerase chain reaction (PCR) with specific upstream and downstream oligonucleotides. The upstream oligonucleotide was 5'-CAG ggT aCC TGG AAG ATG CCG AGA TC-3', and the downstream oligonucleotide was 5'-CCT GGG taC CGC TGT GCC CTC ACT CG-3', where lower case letters indicate changes to meet the KpnI cutting site (underlined). The PCR product contains the full-length coding region of the gene encoding POMC with the expected length of 854 base pairs (bp). After cloning into pUC18 vector, white colonies (lacZ mutation) were selected, and plasmid DNA was purified with a Mini Plasmid DNA preparation Kit (Qiagen), digested with KpnI and subjected to electrophoresis on an agarose gel. The plasmids with the correct insert were verified by DNA sequencing. The correct POMC gene was then cloned to the KpnI site of pCMV-Script (Clontech Co.). The preparation and purification of the plasmid from cultures of pCMV–POMC-transformed Escherichia coli were performed by the column method (Qiagen Mega Kit; Qiagen Inc, Valencia, CA, USA). The purified plasmid was diluted in phosphate-buffered saline (PBS) to appropriate concentrations according to the injection dose: 200 μg (1.0 μg/μl) and 20 μg (0.1 μg/μl). All experimental procedures were reviewed and approved by the Institutional Animal Care and Use Committee before the study was initiated. These adhered to the guidelines for pain experiments in awake animals. Male Sprague–Dawley rats (350–375 g, Sprague–Dawley, National Science Council, Taipei, Taiwan) were used in this study. Two groups of rats were used, normal (nonarthritic control) and CFA-treated (arthritis group) rats. Each group was further divided into subgroups, with seven test animals or seven control animals in each subgroup. They were group-housed, and the temperature was maintained at 22°C on a 12 hours light/12 hours dark cycle. Nonarthritic control animals were also group-housed separately from the arthritis groups. The experimenter was blinded to treatment classification throughout the study, although inflammation related to the adjuvant was evident during behavioural testing. Arthritis was induced by injecting 0.3 ml of 5.0 mg/ml CFA (consisting of heat-killed Mycobacterium butyricum in mineral oil) intradermally into the plantar surface of the left hindpaw at day 7 after intramuscular injection and electroporation. Adjuvant was injected into rats under anaesthesia in a Plexiglas box with 3% isoflurane in a 1:1 mixture of O2 and room air. Before blood collection, rats were deeply anaesthetized with isoflurane. About 2 ml of blood was sampled from the heart at 1, 2 and 3 weeks after transfection with the gene encoding POMC. Seven rats per time point were used to analyse the ACTH and endorphin levels in serum. Serum from rats that received direct intramuscular injection of DNA without an electrical pulse or from rats transfected with PBS only (no DNA) served as the control group. Endorphin and ACTH concentrations were assayed with a radioimmunoassay (RIA) kit (Nichols Institute Diagnostics, San Juan Capistrano, CA, USA). This kit has a linear range of measurement between 5 and 200 pg/ml ACTH and endorphin, with a detection threshold of 5 pg/ml. Rats were rapidly decapitated under deep general anaesthesia. Transfected and nontransfected muscles were retrieved at days 3, 5, 7 and 14 after injection with CFA. Seven rats per time point were used to analyse the ACTH and endorphin levels in muscle. The rats that received the direct intramuscular injection of DNA without an electrical pulse or those that were transfected with PBS (no DNA) served as the control group. Endorphin and ACTH concentrations were assayed by using human ACTH and endorphin-specific RIA kits (Nichols Institute Diagnostics), and the total cell protein was analysed with the Bio-Rad protein assay. RIA values were normalized to total protein. The muscle was removed and rapidly frozen in liquid nitrogen, then stored at -80°C before assay. The muscle was homogenized by sonication in ice-cold lysis buffer (50 mM Tris-HCl, pH 7.5, 150 mM NaCl, 2% Triton X-100, 100 μg/ml phenylmethylsulphonyl fluoride, 1 μg/ml aprotinin), then centrifuged at 50,000 gfor 30 minutes at 4°C. The protein content of the supernatant was determined with the Bio-Rad protein assay system. An equal volume of sample buffer (2% SDS, 10% glycerol, 0.1% bromophenol blue, 2% 2-mercaptoethanol, 50 mM Tris-HCl, pH 7.2) was added to the test and control samples. RNA was extracted from muscle tissue by a standard TRIzol® (Gibco) method, with some modifications . Each muscle was homogenized in TRIzol reagent and RNA was precipitated with propan-2-ol. Subsequently, RNA was mixed in a solution consisting of 1 × PCR buffer, 0.01 unit/μl ribonuclease inhibitor and 0.04 unit/μl deoxyribonuclease I. The reaction mixture was incubated at 37°C for 30 minutes. Immediately after incubation, 0.25 μg/μl proteinase K was added to the reaction mixture and incubated again for 30 minutes. After precipitation of RNA, cDNA synthesis was performed with oligo(dT) primer, as described by the manufacturer. PCR was performed with an amplification cycle profile consisting of 94°C for 1 minute, 62°C for 1 minute and 72°C for 2 minutes per cycle. After 30 PCR cycles, an additional cycle at 72°C for 7 minutes was performed to ensure complete DNA extension. The endorphin primers were designed on the basis of the pE-POMC mRNA sequence and were as follows: sense, 5'-AG ACT GCA AGA TGG TC-3' ; antisense, 5'-T GTA CGA CAG CAG GTA-3' ; a 454 bp product resulted. Primers for the β-actin were designed on the basis of the rat cytoplasmic β-actin gene (GenBank accession number V01217) and were as follows: sense, 5'-ACA CCC CAG CCA TGT ACG-3' ; antisense. 5'-TGG TGG TGA AGC TGT AGC C-3' ; a 225 bp product resulted. Before and after the induction of the adjuvant arthritis, the thermal nociceptive threshold of the rats was measured by using a modification of the plantar test. The animal was placed on a glass plate (maintained at 30°C) for 5–10 minutes for adaptation. The latency between the application of a focused light beam and the hindpaw withdrawal response was measured to the nearest 0.1 second. The cut-off time in the absence of a response was 20 seconds. This value was then assigned as the response latency. The severity of inflammation was monitored daily on days 0–14 by measuring hindpaw volume by water displacement. Swelling (water displacement [ml], means ± SEM) is shown in Fig. 4 (n = 7 per group). Paw swelling during CFA injection in control rats (SG VIII) and rats receiving POMC gene and electroporation (SG VI) and electroporation and paw CFA injection (SG VII). POMC gene injection and electroporation (SG VI) suppressed the swelling. Results are means ± SEM. Statistical comparisons between groups were made by analysis of variance; individual comparisons were made with the post-hoc test. *P < 0.05. Muscle tissues for the histological study were fixed with 4% paraformaldehyde in PBS for 4 hours and then in 30% sucrose in PBS overnight. The muscle tissues were cryosectioned to a thickness of 10 μm, and blocked in 2% normal goat serum for 2 hours at room temperature. Sections were then incubated for 2 days with primary rabbit antiendorphin antibody (1:500; Chemicon, Temecula, CA, USA) in 10% normal goat serum and 0.3% Triton X-100 (Sigma, St Louis, MO, USA) at 4°C. To ensure that immunostaining was specific, control samples were incubated in the same solutions without primary antibody. The sections were washed three times with 0.2% Triton X-100 in PBS, then incubated with fluorescence-conjugated secondary antibodies (Jackson ImmunoResearch, West Grove, PA, USA) for 1 hour. The slides were then sealed with the Prolong Antifade kit (Molecular Probes, Eugene, OR, USA) after drying, and subjected to image analysis. To record the images, slides were examined with a fluorescence confocal microscope (Leica, TCS, SPII, Heidelberg, Germany). Microscopic examination of the electroporated muscle was performed on a paraffin section of formalin-fixed muscle. Ten transverse sections from one extremity to the other were performed and stained with haematoxylin and eosin. All sections were assessed by a blinded observer. The paw withdrawal latency data and the RIA data for β-endorphin and ACTH levels were expressed as means ± SEM. One-way analysis of variance for repeated measures with Bonferroni post-hoc analysis was used to detect differences between the groups. P < 0.05 was considered significant. Two groups of rats were used in the study: normal rats and rats treated with CFA to induce arthritis. Rats in group A (normal rats) were assigned to five subgroups (SG), I, II, III, IV and V, as follows: SG I (n = 7), intramuscular electroporation with 200 μg of pCMV–POMC; SG II (n = 7), intramuscular electroporation with 20 μg of pCMV–POMC; SG III (n = 7), intramuscular electroporation with PBS; SG IV (n = 7), intramuscular injection with 200 μg of pCMV–POMC without electroporation; and SG V (n = 7), injection of PBS without electroporation, as control group. The serum levels of ACTH and endorphin in SG III and SG IV were not significantly increased in comparison with the SG V control group. SG II rats, which received 20 μg of pCMV–POMC by electroporation, showed a modest increase in the levels of ACTH and endorphin, but this was not statistically significant when compared with SG V. In contrast, SG I, which received intramuscular electroporation with 200 μg of pCMV–POMC, showed increases in the serum level of ACTH and endorphin that peaked at 2586 and 1859 pg/ml at week 1, respectively. This gradually decreased to 750 and 351 pg/ml at week 3, respectively. At all time points of the reported experiment, the serum level of endorphin in SG I was much higher than that of SG IV (from 12-fold at 7 days to 3.5-fold at 21 days). The time courses of serum ACTH and endorphin after intramuscular electroporation with the gene encoding POMC are shown in Figs 1 and 2. Time course of POMC gene injection and electroporation on the blood levels of ACTH. Results are means ± SEM. Statistical comparisons between groups were made by analysis of variance; individual comparisons were made with the post-hoc test. *P < 0.05. Time course of POMC gene injection and electroporation on the blood levels of beta-endorphin. Results are means ± SEM. Statistical comparisons between groups were made by analysis of variance; individual comparisons were made with the post-hoc test. *P < 0.05. We performed CFA injection at 1 week after muscle-targeted transfer of 200 μg of pCMV–POMC or PBS using intramuscular electroporation. 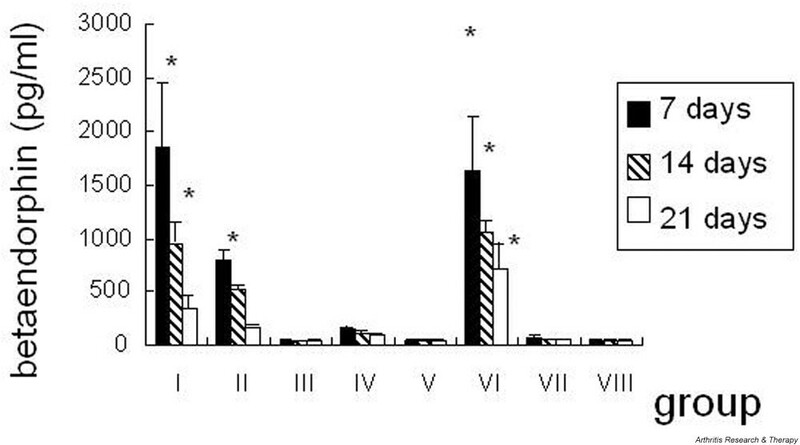 CFA-treated rats were divided into five subgroups (SG), VI, VII, VIII, IX and X, as follows: SG VI (n = 7), intramuscular electroporation with 200 μg of pCMV–POMC followed by injection with CFA; SG VII (n = 7), intramuscular electroporation with PBS followed by injection with CFA; SG VIII (n = 7), intramuscular PBS injection with CFA only (this group was used to determine whether CFA itself significantly induced the production of endogenous ACTH and endorphin); SG IX (n = 7), treated as SG VI except that, 30 minutes before the nociceptive test at 7 days after CFA injection, naloxone (1 mg/kg) was administered intraperitoneally to determine whether any analgesic effect was mediated through the opioid receptors; and SG X (n = 7), intramuscular electroporation with 200 μg of pCMV-Script vector alone added to the negative control to demonstrate that pCMV-Script vector alone could not induce POMC expression. 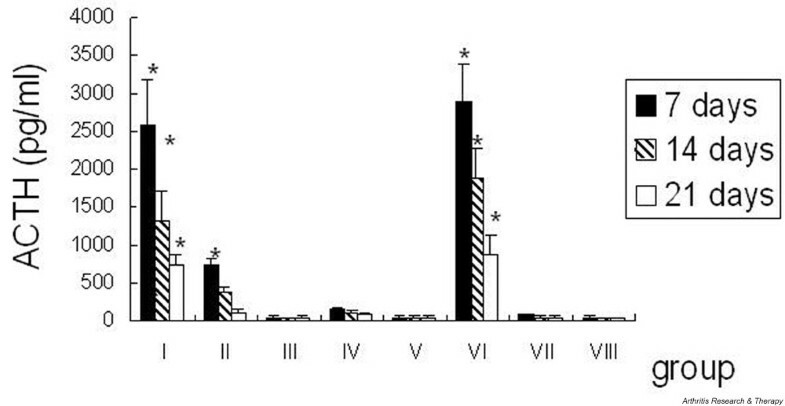 The serum levels of ACTH and endorphin in SG VII were not significantly increased in comparison with the SG V control. Moreover, there was no difference between SG VII and the other control group (SG VIII, PBS and CFA only). We can therefore answer that electroporation itself did not induce significant expression of ACTH or systemic effects. The serum levels of ACTH and endorphin in SG VII were not significantly increased in comparison with the SG V control. In contrast, SG VI, which received intramuscular electroporation with 200 μg of pCMV–POMC, showed increases in the serum level of ACTH and endorphin that peaked at 2904 and 1642 pg/ml, respectively, at week 1. This gradually decreased to 870 and 716 pg/ml, respectively, at week 3. The time courses of serum of ACTH and endorphin concentrations after intramuscular electroporation with the gene encoding POMC in CFA-treated rats are shown in Figs 1 and 2. The thermal nociceptive thresholds of control rats (SG I–IV) including injection with 200 μg of pCMV–POMC and electroporation did not show any difference from the PBS (SG V) injection group (P > 0.05) (data not shown). The thermal hyperalgesia of CFA rats (SG VI) injected with 200 μg of pCMV–POMC and electroporation was significantly improved at 3, 5 and 7 days after CFA injection in comparison with the groups receiving PBS with electroporation (SG VII) or only CFA injection (SG VIII) (P < 0.05; Fig. 3). It is noteworthy that pCMV–POMC plus naloxone (SG IX) showed similar thermal thresholds to SG VII, SG VIII and SG X (pCMV vector alone) (P > 0.05; Fig. 3). Thermal hypersensitivity responses during CFA injection. The POMC and electroporation group (SG VI) suppressed the CFA-induced pain (*P < 0.05), showing a significant difference between rats receiving electroporation and CFA (SG VII), CFA only (SG VIII) and electroporation of pCMV vector alone (SG X), whereas naloxone reversed the analgesic effects of POMC (SG IX). Results are means ± SEM. To determine the anti-inflammatory effects caused by intramuscular electroporation gene therapy with POMC, we measured paw swelling in CFA rats in subgroups SG VII, which received intramuscular electroporation with PBS, and SG VI, which received 200 μg of pCMV–POMC. SG VIII rats, which received only CFA injection, were used as a control group. The peak effect was noted at day 7 in SG VI (Fig. 4). Rats injected with PBS with electroporation showed a similar degree of swelling to that of the control group (CFA only). However, naloxone administered at 7 days after CFA injection was without any significant effect in paw swelling in polyarthritic rats that received 200 μg of pCMV–POMC (SG IX). A high level of transfer of the gene encoding POMC was obtained after electroporation of muscle tissue. This was determined by analysis of the muscle endorphin level by RIA (Fig. 5). The peak effect (650 pg/ml) was noted at day 5 in SG VI. This gradually decreased to 189 pg/ml at day 14 after CFA injection. 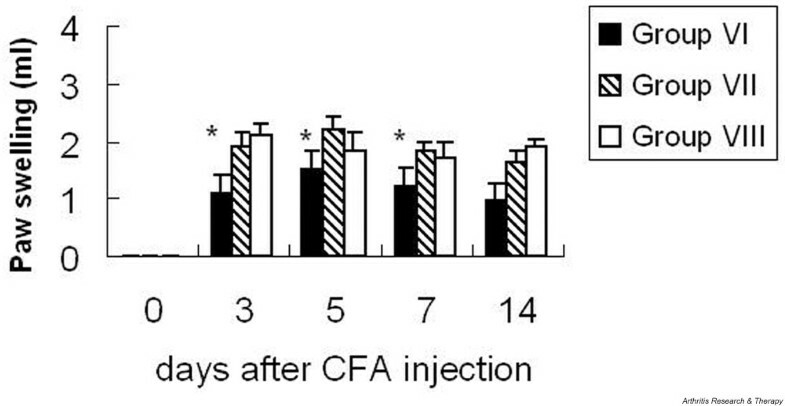 Effect of POMC injection on levels of endorphin in muscle at days 3, 5, 7 and 14 after injection with CFA. Results are means ± SEM. Statistical comparisons between groups were made by analysis of variance; individual comparisons were made with the post-hoc test. *P < 0.05, showing a significant difference between rats receiving electroporation (SG VII) and CFA only (SG VIII). Muscle endorphin mRNA was detected by RT–PCR from week 1 to week 3 (Fig. 6). RT–PCR products of the expected size (450 bp) were obtained with RNA extracted from six pieces of muscle tissue transfected with pCMV–POMC. This was true in all the POMC-transfected animals. Control tissues failed to show any pCMV–POMC mRNA by RT–PCR. These findings indicate that pCMV–POMC mRNA was transcribed in the transfected muscle (Fig. 6). RNA levels of β-endorphin were measured at weeks 1, 2 and 3 after injection with PBS (SG III) or 200 μg of POMC cDNA (SG I) and electroporation. Results are means ± SEM. Statistical comparisons between groups were made by two-tailed unpaired t-test. *P < 0.05, showing a significant difference between the control groups and the POMC gene and electroporation group. Intramuscular injection of 200 μg of pCMV–POMC followed by electroporation was performed to see the effects of transfection in muscle tissue and the location of endorphin. Peak fluorescence was noted at week 1 in the electroporated muscle (Fig. 7). Muscle injected with DNA without electroporation showed weaker immunoreactivity than that in the control group (PBS injection without electroporation). Confocal micrographs of POMC gene electroporation on endorphin expression in muscle. (A) Immunohistochemical detection of endorphin immunoreactivity in the negative control that omitted the primary antibody. A muscle nucleus is labelled by 4,6-diamidino-2-phenylindole (blue). (B) Overexpression of endorphin immunoreactivity (green) in the POMC-treated group. Scale bar, 40 μm. (C) High-magnification image (from (B)) of endorphin-positive puncta shows the detailed distribution of endorphin in a muscle cell. Scale bar, 20 μm. (D) Endorphin-positive puncta are absent from muscle electroporated with pCMV-Script vector alone. Scale bar, 20 μm. (E, F) No significant inflammatory cell infiltration or muscle damage on haematoxylin/eosin staining of POMC-electroporated muscle (E) and untreated muscle (F). Original magnification, ×200. Scale bar, 100 μm. We cannot exclude the possibility of low and transient tissue damage induced by electroporation. However, haematoxylin/eosin staining did not demonstrate abnormal inflammatory cell infiltration or necrosis at the voltage used. The results of this study show that intramuscular electroporation could serve as an alternative efficient method for somatic gene delivery, in this case the gene encoding POMC. This intramuscular electroporation method could overcome many of the problems associated with viral gene delivery to skeletal muscle, which is largely based on retrovirus, adenovirus or herpes simplex virus. By avoiding the use of these viral vectors, several such barriers or limitations to gene delivery could be overcome. First among such barriers is the cytotoxicity of these viral vectors, which has hampered both viral transduction efficiencies and long-term transgene expression after viral injection [21, 22]. Another barrier is the marked inflammatory responses associated with the use of viral vectors and the therapeutic protein, which lead to a significant decline in the number of transduced myofibres [23, 24]. Electroporation has been shown to be a powerful gene delivery method for muscle by creating pores in the membrane through which plasmids can insert into the cells . Efficiency and toxicity are the two most important aspects in the search for potential pain gene therapies, with toxicity often being the limiting factor. Because the gene encoding POMC has not previously been transferred via the intramuscular route and by electroporation, this study was also designed to assess the safety of this intramuscular gene therapy with pCMV–POMC. In addition, the relative effectiveness of gene transfer was determined at two plasmid concentrations. The results of our study showed evidence of bioactivity in the form of ACTH and endorphin gene expression at the protein level and in terms of anti-hyperalgesic effects. From the perspective of safety and/or acceptability, no significant adverse effects were observed in this study in terms of respiratory depression or sensory/motor dysfunction. 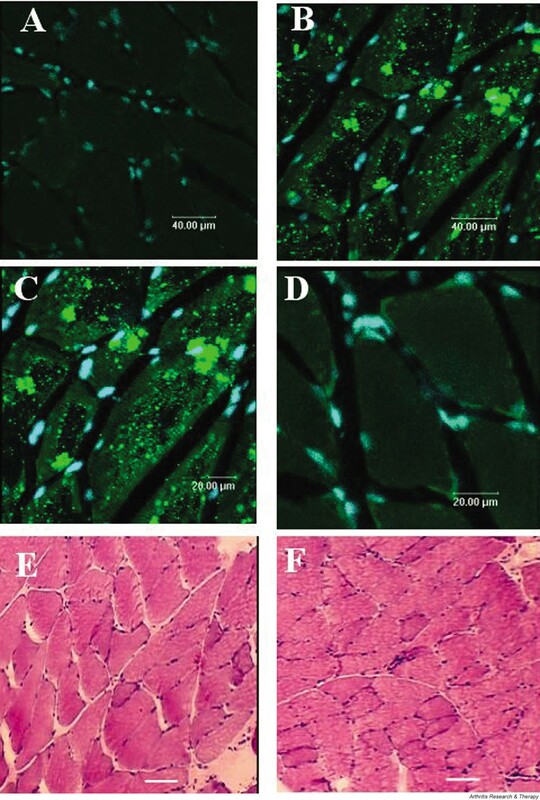 Histological examination of the electrotransfected muscle revealed no evidence of damage after transfection, and there was no apparent morbidity and definitely no mortality. 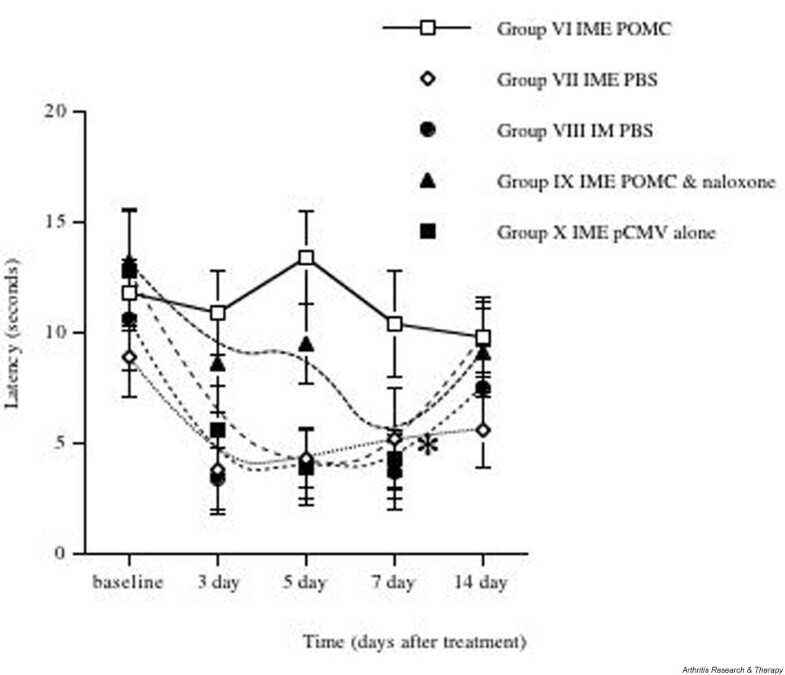 We have shown that intramuscular gene therapy with pCMV–POMC is safe. However, these promising results should be further validated with multiple dosing and prolonged follow-up. It would be very useful to determine whether the effect might be mediated by ACTH or endorphin alone: a control group consisting of animals given ACTH or endorphin directly should be compared with the POMC gene transfer group. In fact, it has been shown clinically in humans that exogenous ACTH has antinociceptive effects when administered by a single intramuscular injection of 40 IU of ACTH. However, the effect of direct injection of ACTH into the muscle is brief, so we do not expect any therapeutic effect 7 days later . The analysis of gene expression at the protein level by the use of an RIA assay for ACTH and endorphin documented considerable individual variability. Although the serial ACTH levels in the POMC-transfected rats tended to peak 1–2 weeks after gene transfer, the degree of elevation was highly variable. This might have been due to variable transducibility with electroporation. However, the anti-hyperalgesic and anti-inflammatory effects of gene delivery corresponded to increased ACTH and endorphin levels and were consistent with the time course of gene expression (3–21 days) that was established in animal studies. This finding was a predictor of clinical improvement. β-Endorphin has been shown to exert several effects on the immune system, including the suppression of peripheral lymphocyte proliferation and the inhibition of natural killer cell activity, interleukin-2 production and interferon-γ production . Moreover, a study on experimental autoimmune encephalomyelitis in Lewis rats, the animal model for multiple sclerosis, reported that administration of the opioid antagonist naloxone markedly increases the severity of the condition . In our study, we found that rats that received only CFA injection had low endorphin levels compared with those receiving POMC with electroporation. At present we have no data to support the hypothesis that the decrease in endorphin concentration precedes the onset of inflammation, acting as a putative cofactor for disease development. The serum concentrations of ACTH and endorphin reflect the transfection effects of POMC and its release, but not its synthesis. However, high intramuscular concentrations of endorphin corresponded to a sustained secretion of β-endorphin from muscle. 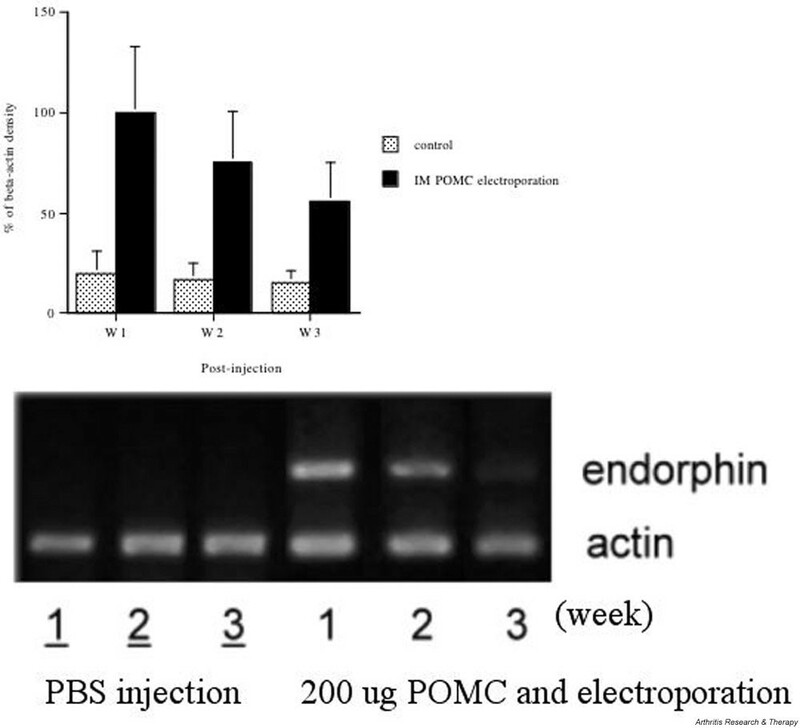 Moreover, a decrease in paw swelling with POMC gene electroporation was observed, as a consequence of the biological activity of ACTH and endorphin. The increased synthesis of ACTH and endorphin might therefore also explain the balance between proinflammatory and anti-inflammatory cascade. Our study is the first to show an increase in endorphin and ACTH concentrations during intramuscular electroporation gene therapy. In summary, these data indicate that intramuscular electroporation with the gene encoding POMC can mediate potent antinociceptive effects. Opioid peptides unable to cross the blood-brain barrier are the natural ligands for opioid receptors. Peripheral gene therapy with the gene encoding the 'pain-killer' POMC holds significant promise for the control of inflammatory pain in conditions such as rheumatoid arthritis and osteoarthritis. We thank Professor Nina Gloriani Barzaga for her help in reading and editing the manuscript. This work was performed with the support of Chang Gung Memorial Hospital CMRP and the Taiwan National Science Council NMRP (Genome Project).